BRITAIN’S FUTURE PROSPERITY REQUIRES REVOLUTION. A RENEWABLES REVOLUTION. Posted on December 14, 2016 by Norwich Radical	in Inter|national and tagged borders, Britain, british politics, climate, climate change, climate crisis, coal, community energy, ecotricity, electricity, emissions, energy, environment, environmental, environmental sustainability, environmentalism, gas, immigration, international, inter|national, migration, nuclear, oil, ovo, renewable, renewable energy, solar, Sports Direct, wind, work, workers. 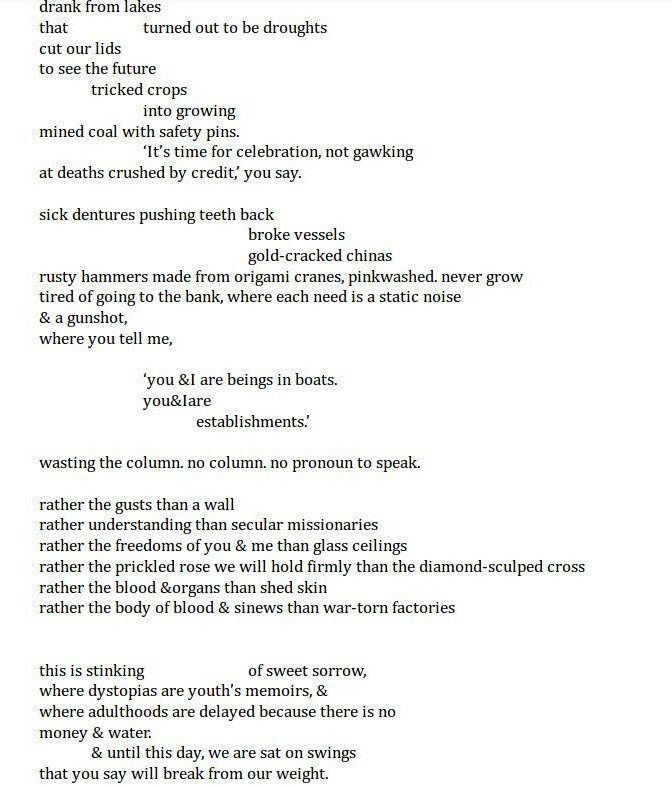 Posted on August 4, 2016 by Norwich Radical	in Arts and tagged adulthood, celebration, class, coal, creative writing, credit, dystopia, economy, establishment, formatting, growing up, gunshot, LGBTQIA+, memory, money, neoliberalism, personal, pinkwashing, poem, poetry, political, politics, pronoun, racism, response, SAD, safety pin, war, writing. mined coal with safety pins. at deaths crushed by credit,’ you say. ‘you &I are beings in boats. wasting the column. no column. no pronoun to speak. that you say will break from our weight. Posted on July 30, 2016 by Norwich Radical	in Inter|national and tagged #greenleadership16, anti austerity, ATOS, austerity, british politics, coal, coal mining, GMB, Green, green leadership, Green Party, greens, inequality, politics, tax, trade union, trade unions, uk politics. THE CLIMATE BETRAYED AGAIN — AND WHO BETTER TO DO IT? Posted on July 4, 2016 by Norwich Radical	in Inter|national and tagged climate, climate betrayed, climate change, climate crisis, coal, Community, consumers, debt, economy, environment, extortion, government, industry, international politics, neoliberalism, paris, Paris Climate Agreement, privitisation, profit, science, state, Stockholm University, Sweden, system change. With the recent news that the Swedish government has backtracked on its pledges at the Paris climate agreement by selling off state-owned coal assets to private buyers EPH, now is a better time than ever to ask: when is it enough? It should come as no surprise that governments will betray the public façade of agreement on positive terms. Such is the cycle of history. I am thinking, in particular, of the Paris Agreement that took place just last year. Not yet past its stage of infancy, and already it has been shot in the back. The selling off of a lucrative coal asset to private industrial proprietors has set a clear line for where their favour lies and where the climate — which has recently passed a dire milestone — sits in the rank of importance.